Guess what I had for breakfast this morning? 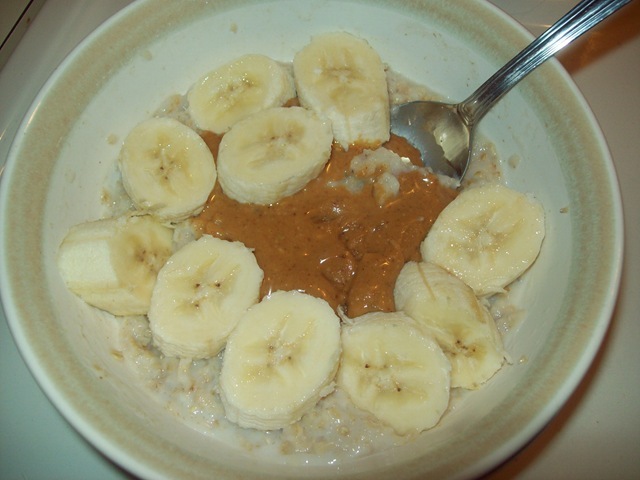 Haha…I promise that will be changing up a bit soon 😉 For those who don’t know, it’s oatmeal with PB and banana. Mid-morning, I tried something for a snack that I hadn’t had in a while. 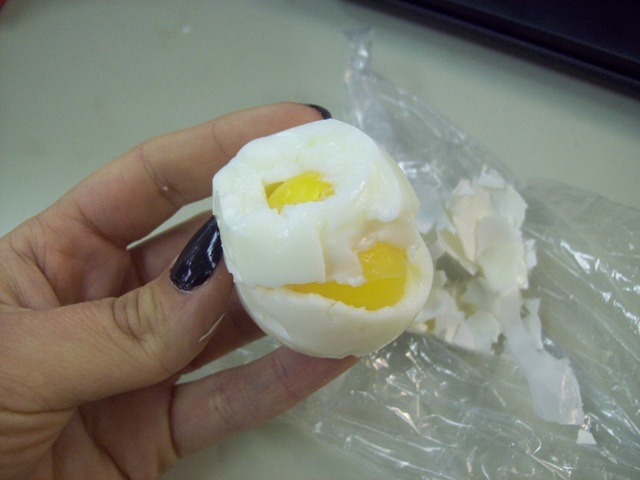 I had some eggs in my fridge that I needed to try and use up this week so I thought, why not make some hard boiled eggs? It was yummy (even though it kinda fell apart when I peeled it) and made a great proteinous snack. I’m not kidding when I tell you that today’s lunch was the best salad combo I have ever made! 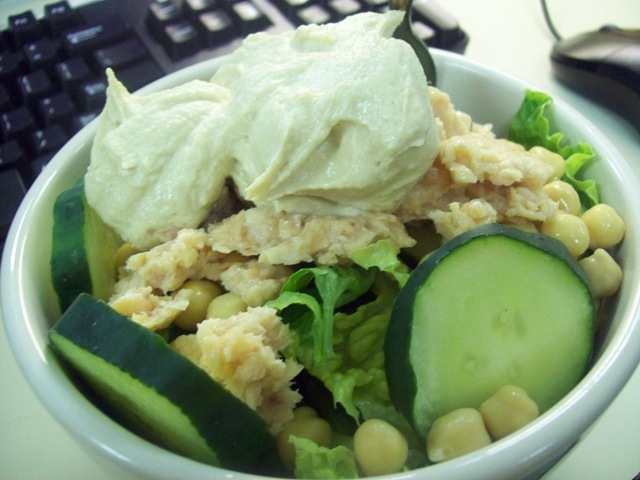 Romaine, cucumber, 3 oz packet of salmon, 1/4 cup chick peas, 2 generous tbsp of classic hummus….I can’t even tell you how good this was. I definitely think the salmon + hummus was what made it but everything else fit together nicely too. Mid-afternoon, I snacked on some mixed nuts before heading to the gym for a killer upper body workout: we warmed up for 5 minutes on the treadmill, then did every exercise for triceps and lats that we could think of, plus a few abs and back exercises as well. Then we rounded it out with 10 more minutes on the tread and I climbed a bit (incline) just to give it some variety. I am going to be sore tomorrow! 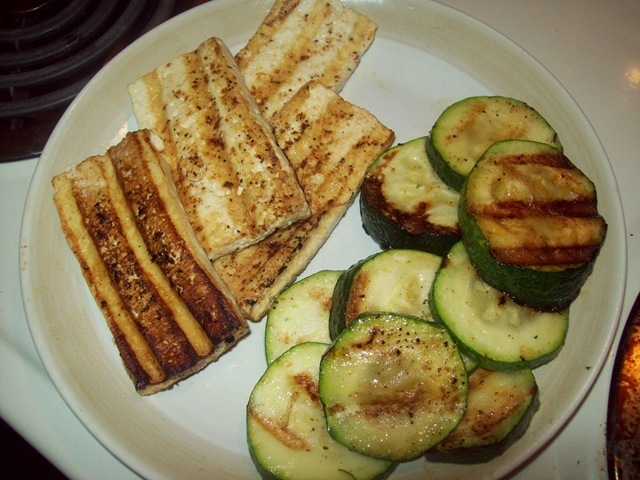 For dinner, I made grilled zucchini and grilled tofu. 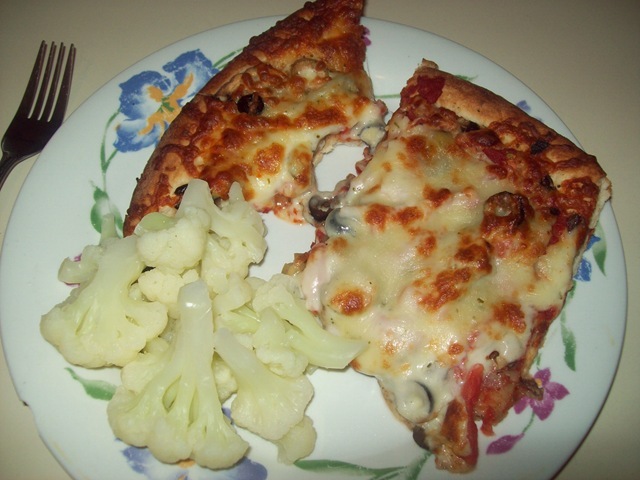 I will share the details with you in a later post which will focus on cooking with canola oil. I can’t wait! Ok, so I can. Have a great night everyone! Thanks for reading. This computer is usually okay for using Windows Live Writer but when it comes to internet, which I had to access this time around, it is slower than anything I can even imagine. It just took me 29 minutes to actually start blogging from the time I sat down. I can’t wait to get rid of this thing. Anyway, sorry I didn’t post yesterday but I got home late and Josh was on the fast computer (ugh). When I woke up yesterday morning, I had a strong urge (and a few extra minutes) to do some yoga, so I chose Yoga Download’s 20 minute hip opening flow class. It was awesome! We did a 60 minute cardio workout, warming up for 5 minutes on the treadmill, doing intervals on the bike for 40 and then another 5 on the tread to cool down. It was intense! I also had my friend, who is a trainer, do some measurements on me so I can see where I stand…more on that later (don’t worry I’m optimistic as usual)! Mid-morning I had my very last mini Larabar…I would be sad but I’ve had them for so long that I’m kind of glad to have used them all up! 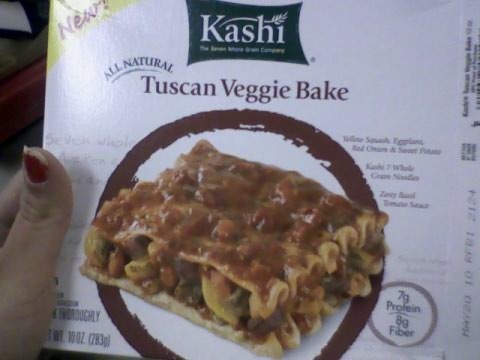 I had a coupon for $2 off a Kashi meal so I took advantage and got this bad boy for just a little over $1. Pretty soon I’m going to write about how to be healthy and try new stuff on a budget because I keep figuring these little things out. The meal was good but I was glad I paired it with the salad because I don’t think it would’ve been filling enough on its own. 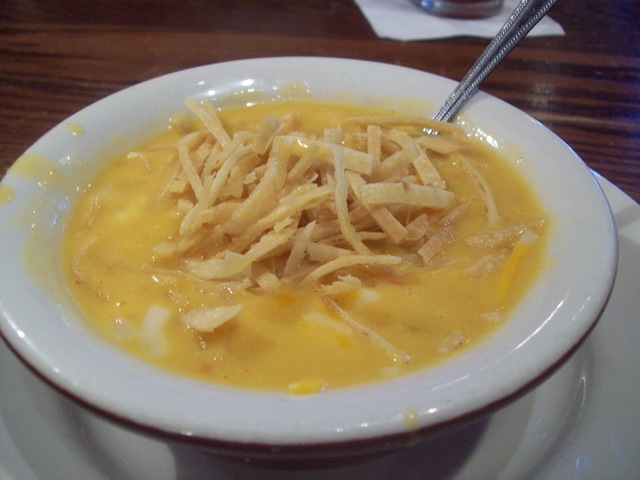 The only one I’ve had that was is the Black Bean Mango and I’m pretty sure that is due to the beans. Mid-afternoon, I had a carrot with PB as a snack which held me over very well! 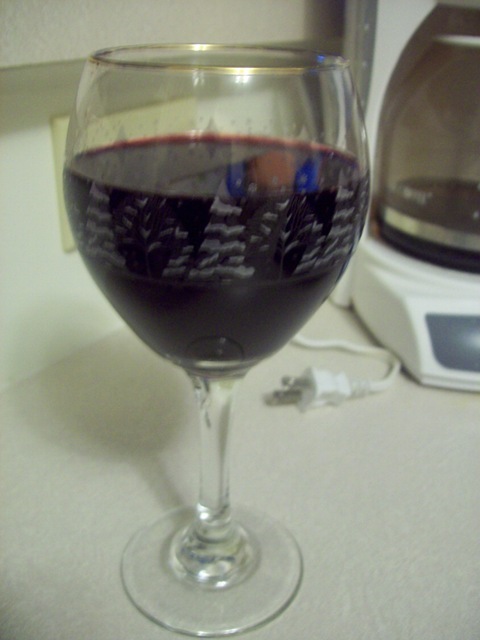 When I got to Courtney’s that evening, she offered me the last glass of Yellow Tail Shiraz and I could not pass it up, I hadn’t had good red wine in a while…I know it’s cheap but Yellow Tail is one of my favorite brands! 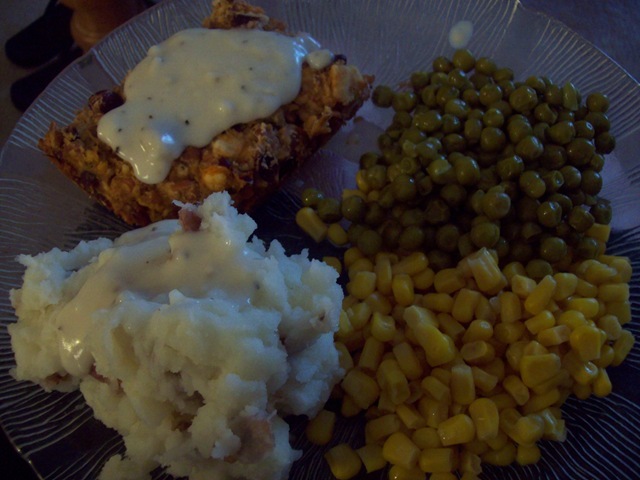 Dinner was Margie’s bean loaf (a faux meatloaf made with beans and veggies), green peas, corn, and mashed potatoes that I brought. They are out of a bag, Ore Ida brand I believe, red potatoes that you steam in the micro and then mash once they are done. They are not the most cost effective things in the world, but they were way healthier than most instant or already made mashed potatoes! 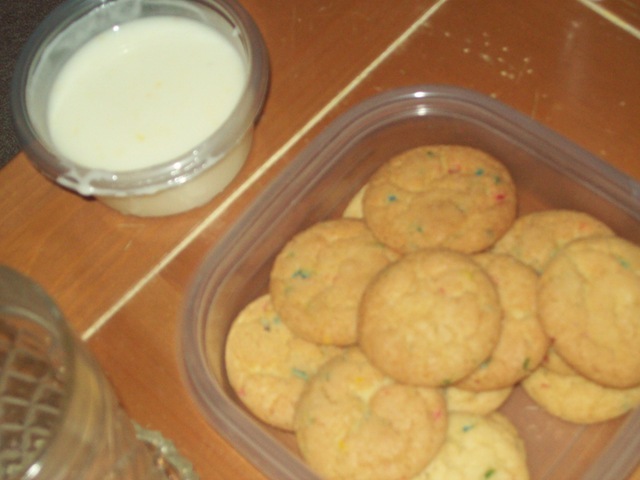 For dessert, Beth brought confetti cookies and a homemade lemon icing “dip” which was too runny to ice the cookies with. She said it was made with lemon zest and powdered sugar, which is something I would usually avoid (trying to steer clear of the added sugar) but I tried it and it was great 🙂 I like to make exceptions once in a while! I also had some decaf vanilla chai tea while we watched the most recent 2 episodes of True Blood. I really enjoy my regular night with the girls, I think it’s one of the things that keeps me sane! Hope you all had a great Wednesday…be back soon with today and a special post about cooking with canola! 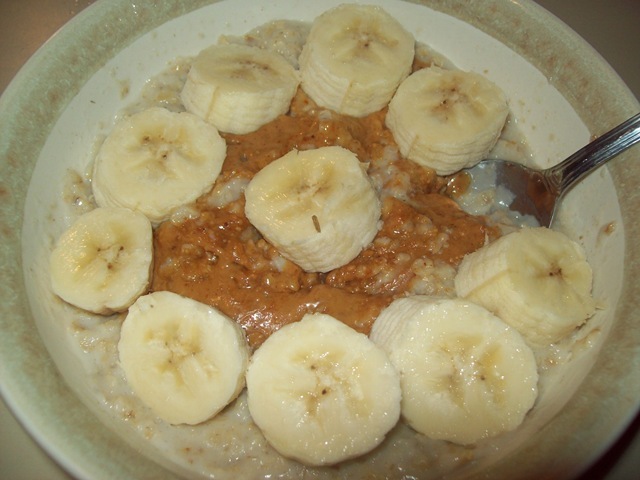 This morning, I had what is slowly becoming my “usual”… oats with banana and PB! Only this time, I cut the portions back just a bit. I used 1/3 cup of oats, 1/3 cup of milk and 1/6 cup of water instead of the usual 1/2 cup measurements. I noticed today that I was just as full with this much as I was with more, so it’s good to know that I actually require less than I think I do. When I got to work, I had a cup of coffee with some International Delight french vanilla creamer (one of the only kinds without trans fat). I managed to hold off a mid-morning snack until 11:30! Our workout today was lots of weight lifting and strength training: chest presses, bicep curls, push ups, abs, flyes, preacher curls, squats, plies…that’s all I can recall. We also warmed up on the treadmill for 5 minutes and then stayed on for 10 after our circuits were finished. I say “our” because I work out with my friend Farrah (who is a trainer) nearly every day. 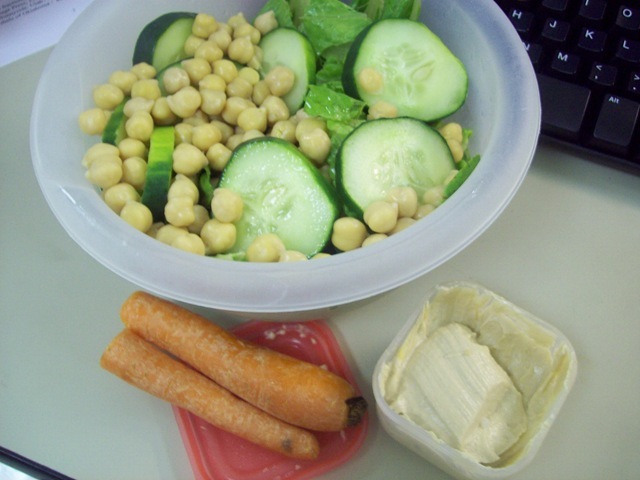 For lunch, I had a big salad (or Hugh Jass as some of you say) with romaine, cucumber, chickpeas and hummus. I have decided today that hummus pretty much goes with everything. 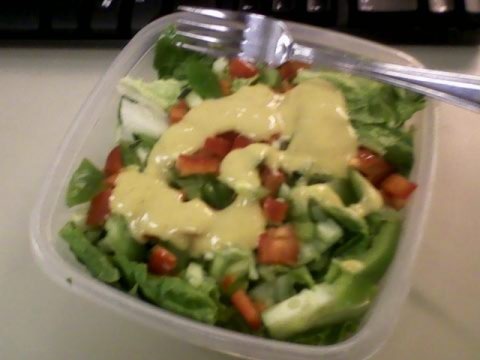 It even works as a salad dressing! Oh yeah, a carrot snuck in there too! Whoever said that when you start eating real carrots you never go back (as in to mini or baby carrots) they were totally right! I can’t even imagine those things now. For my afternoon snack, I had another cup of coffee (eek) and some mixed nuts. I’ve noticed that I need to do protein snacks more in the afternoons because that is when I need it the most. This morning, I woke up very early to get in a work out before work since I knew I’d have a busy day today. 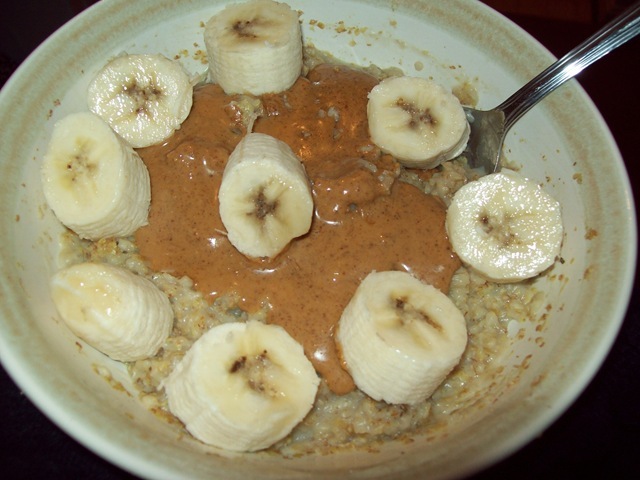 Before hitting the gym, I fueled up on some oats with PB and banana. At the gym, we did a cardio circuit that went something like this: 5 minute warm up on the treadmill, 5 minute moderate walk on treadmill, 5 minutes on the bike, 5 minutes of step ups (wow! ), 5 minutes elliptical, 5 minutes treadmill and 5 minute cool down on the bike. And some stretching! 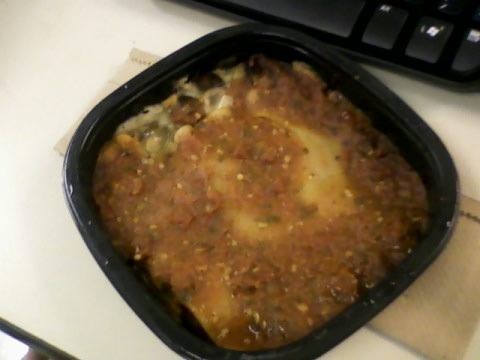 We had a party at work mid-morning where I had some veggies from a veggie tray with salsa and a few cubes of cheese. It was the perfect amount to hold me over, so much lighter than some snacks I’ve been enjoying lately. I had lunch at home, which was a nice change. 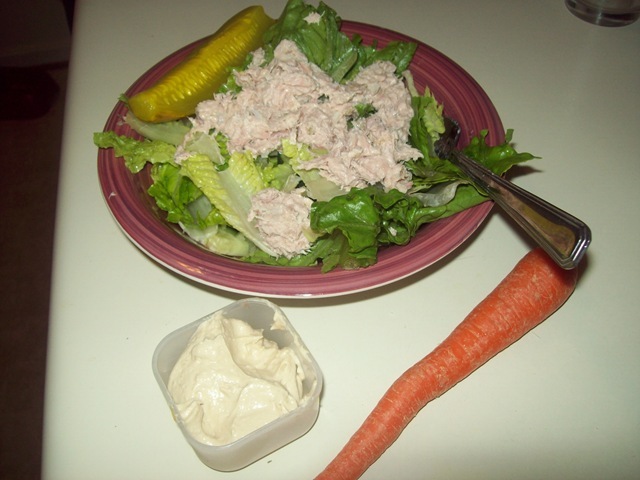 I made a salad with romaine, tuna salad and a pickle, plus a carrot and hummus on the side. On the way home, I snacked on some mixed nuts and a couple pieces of dark chocolate later on. 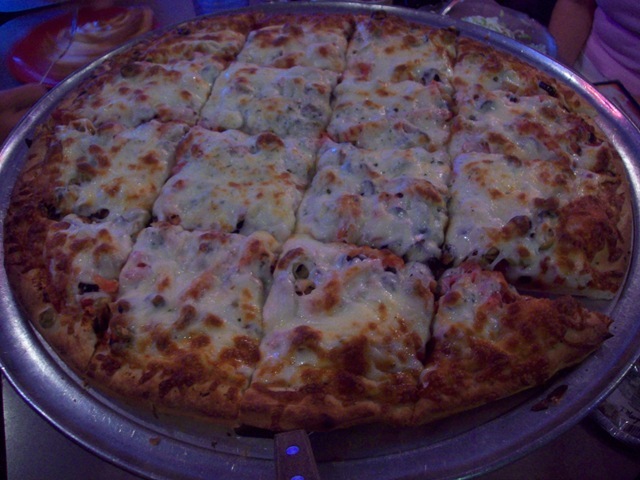 For dinner, we went to Wick’s Pizza, Josh’s favorite place to get pizza and a local chain here in Louisville. I’m not a big pizza eater, but when I do get it, this is one of the best places to go! 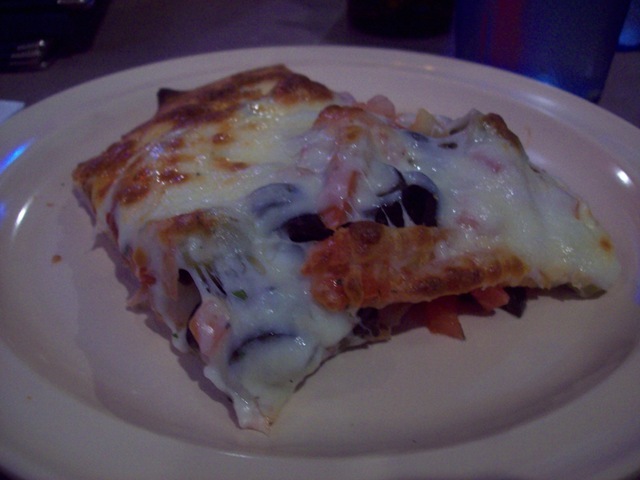 We had a big group, so a few of us split a veggie delight, which came with olives (green and black), tomatoes, onions, mushrooms and normally green peppers but one person didn’t like them so we left those off. It was a HUGE pie! For dessert, I ate two more squares of dark chocolate. I bought a huge bar and I’m hoping it will last me all week! Hope you all had a great day too! I am nearing the end of a really great weekend, that began with a trip to Indianapolis and ended on the couch with my dog watching the “Halloween” remake from a couple of years ago. I’m a big fan of the original but I love Rob Zombie, so I guess I can say it’s okay. The first half is pretty awesome though. Chevy Day was a major success! We got to see two practices, a Q&A with Tony Stewart and lots of other fun displays and people watching. For lunch, I ate an almond butter sandwich I packed in my purse (they let food in thank goodness) and a bag of Sun Chips. I also had some mini Larabars stashed in my purse for snacks. 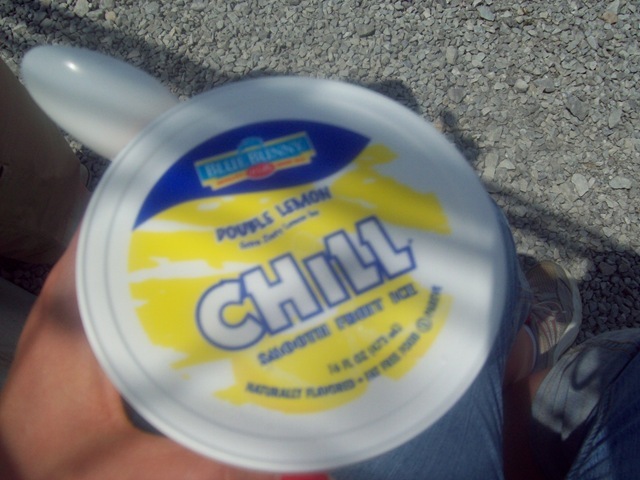 It was hot, though not nearly as hot as last year, and we were parched and tired of water, so we invested in some frozen Lemon ices, which were totally yummy, even if they contained over 60 grams of sugar (eek)! It really quenched it though! 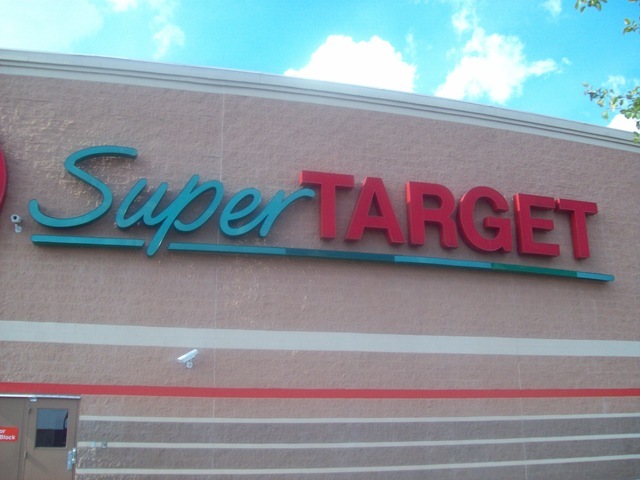 I had never been to one before!! And now we want one at home! 😦 I wish we hadn’t been limited to stuff that has to sit in a hot car all day or else I might’ve made some major purchases! We arrived to a lovely grill out dinner, which really hit the spot after a long day of traveling, loud car watching and sunshine (thank goodness for spray sunblock, it’s the best). 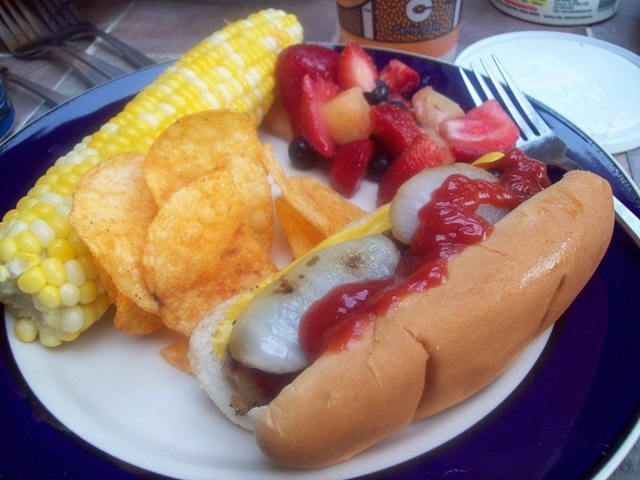 I had a bratwurst with onions and ketchup, corn on the cob, some chips and a lovely fruit salad. Behold. Over the course of the rest of the evening, I had two chocolate chip cookies, two Miller Lites and half of this bad boy that we picked up at Super Target. 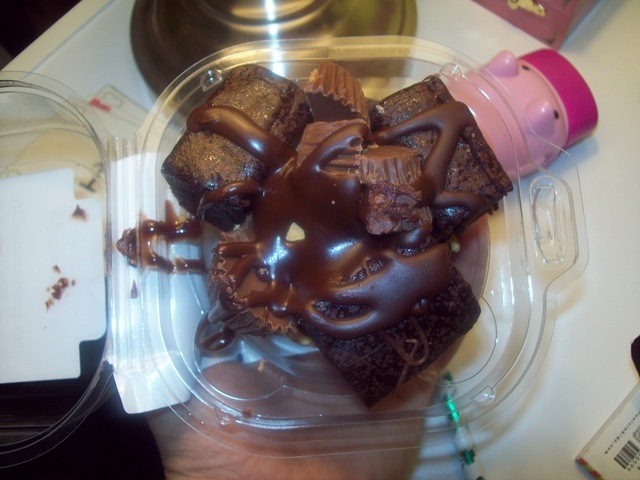 It was some chocolate brownie peanut butter thing with peanut butter cups and chocolate drizzle. Heaven in a plastic container for $2.49. Yowzah, I’m definitely an emotional eater, I think I was tired, not to mention everything just looked so darn good. 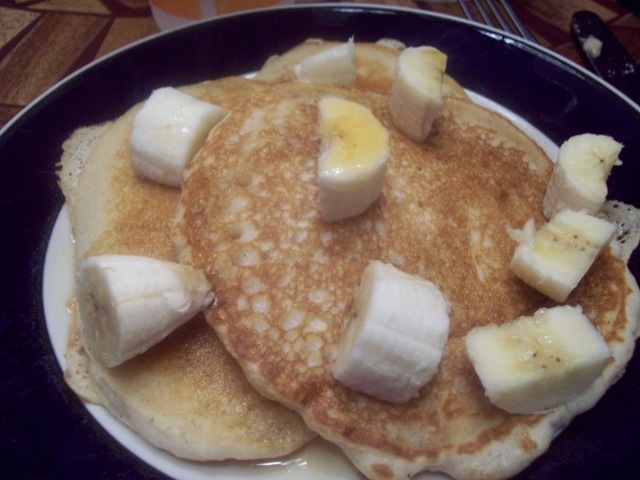 The next morning, my friend made some amazing pancakes, that I topped with half a banana and a small drizzle of syrup. I also had a not pictured yogurt for some protein. On Saturday, we watched qualifying, which was delayed by 4 hours thanks to some lovely rainstorms. But it definitely cooled the weather off so that helped 😉 We also got to see a lot of drivers walk by and got some autographs! We left the Indianapolis Motor Speedway (aka the Brickyard) around 4 in the afternoon, so we stopped for dinner on the way home. We tried to find something we didn’t have at home, but we settled on Max & Erma’s because we were just ready to eat and options were limited. 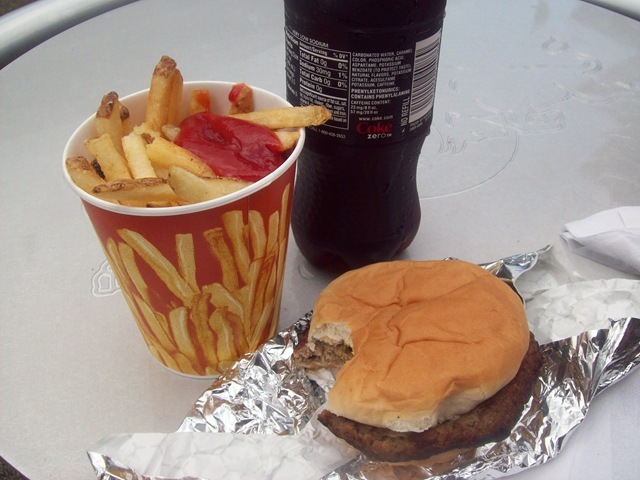 Plus it was the same place we ate on the way home last year so it was like tradition! 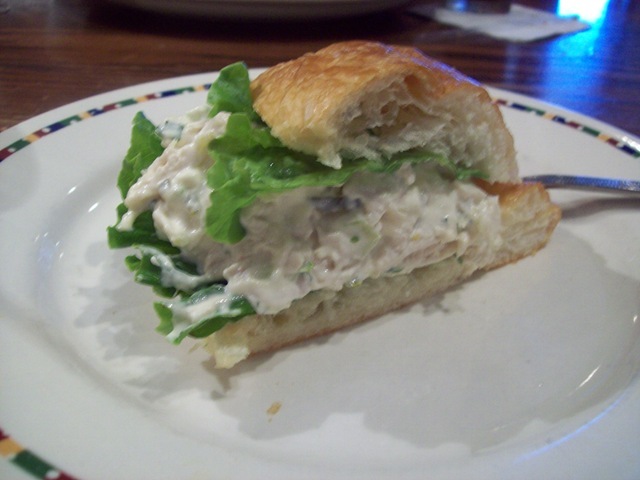 I got half a chicken salad croissant and a bowl of chicken tortilla soup. It was a really great meal and we had an amazing waitress which made it an even better time. I think we just might have to hold up this tradition! 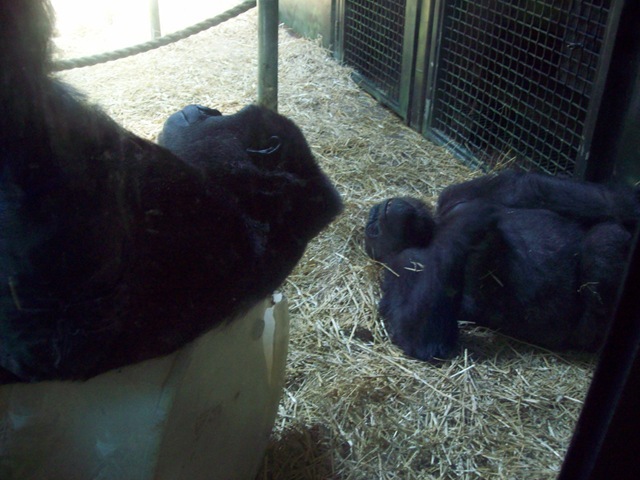 Hope you have enjoyed your weekend as well…”see” you soon! When in doubt, eat breakfast for dinner! Scrambled eggs + red and green peppers and hot sauce and two slices of whole wheat toast with butter (protein, carbs and veggies still covered). Pearled barley (cooked) mixed with 1/2 cup chunky vegetable pasta sauce, 2/3 cup Morningstar veggie crumbles, 1/4 cup chopped green pepper and topped with a sprinkle of parm cheese. This meal was quick, delicious and kept me full for hours. I love it when a random meal works out that way, don’t you? As you are reading this, I am on my way to Indianapolis for practice and qualifying for the Allstate 400 at the Brickyard (which is a NASCAR race, if you didn’t know)! Can’t wait to share what I’m sure will be a crazy weekend with you all when I get back. I like to try a lot of new things and products for the blog and I have noticed that most of my reviews tend to be positive, which even I am getting tired of reading, haha. So I thought I would share with you a couple of things I tried this week that were complete FAILS! First up…chunk light tuna on cucumber slices. It sounded like a good idea. It even looked good. But after a few bites, I just couldn’t stand it anymore! I think the flavors just clashed or perhaps my cucumber was old? I ate the rest of the tuna and other veggies I brought as a side but tossed the cuc slices. Ew! I just had a feeling that without chocolate coating or any other sort of “masking” that this product would taste terrible to me. And I was right. But I gave it a good 2 (tiny) bite shot. Hey blog friends! I guess I just barely made the self-imposed 3-day limit between blog posts, whoops. How are you? I have lots to catch up on but let’s talk first about something “new” I tried recently. I have had almond butter before but only the chunky variety. It was good but I still think PB is the best, in my opinion. This past week or so, I started using another kind of almond butter, Blue Diamond creamy almond butter which I found at Whole Foods. Unfortunately almond butter tends to be a bit more expensive…this one clocked in at $4.99. 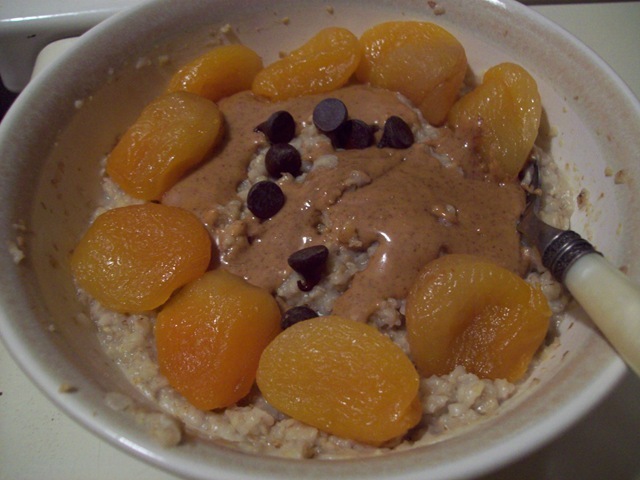 I have eaten it many times this week, many different ways, but mostly in my morning oatmeal! Just as a side note, I have used up all my dried fruit and am now down to just bananas in my oats in the morning. I’ve also cut back on my grain intake (which I learned to overdo as a runner), especially mid day, which I have already noticed make a HUGE difference in my energy levels. No more 2 p.m. slump for this girl! I am a fan of gritty nut butters and this one certainly satisfied that. It took a little getting used to after using PB for so long but it certainly keeps me satisfied and tastes very good. That being said, I’m ready to switch back to PB for a bit – but I’d like to keep almond butter in my regular rotation, maybe I will even try to make my own?! In fact, we are doing much better than when we first got started together 4 years ago. We’ve payed off one car (2nd one will be in November), settled all of his credit card debt and consolidated mine, and we’ve managed to keep a budget so that we are able to pay all of our bills on time and still have a little bit of fun here and there. But we have no savings!! For people who want to buy a house and raise children someday this is just not acceptable. Not to mention dangerous because we all know those “emergencies” (i.e. broken down car) are going to happen, it is inevitable. Unfortunately when this has happened in the past, we’ve had to rely on money borrowed from our parents and/or credit, eek! This past week, we were on a tight budget at the grocery store. We managed to get everything we needed for the week for $35 when we usually spend $50-70/week on average. What I did was write out exactly how many meals/snacks I needed and then went from there. No extras. I even bought shampoo, conditioner, laundry detergent and dryer sheets because we actually needed them. So really, we spent less than $30 on food items! So, I said “Why can’t we shop like we’re broke every week?” Ah ha! Total light bulb moment. Then today I saw a comment from Kath on Twitter about budgeting and she referred me to SELF’s “Save Like Me” blog. Let’s just say I have been taking notes! Only buy what I need at the grocery store each week – This is tough but it is a must and the place I could see the most improvement. Some people buy shoes, I buy too many jars of peanut butter that I don’t need. I need to go with a list and stick to it. Josh has also agreed we can shop more than one place now to get the best deals! Put at least $10 in savings every pay day and don’t touch it – I can put it in, but it almost always comes out. I’m serious when I tell you there is $0.00 in there as I type this. If I had actually stuck to this, I could’ve had at least $260 in there from last year! Redefine what counts as a “necessity” – We would all love to have Starbucks every day but it is just not financially responsible. Like the Save Like Me blog writer says “If a designer latte costs about 100 times what it costs you to make a cup of joe at home, think about it: would you pay $1,000 for a pizza?” I believe this should also apply to dining out…sometimes I feel like I’ve paid $10 for something I could’ve made at home for under $5. Save some fun money – Josh and I have not gotten new shoes, clothes or other things we actually need in ages (hello, a haircut!) because we spend all our money eating out or on other forms of entertainment. We need to establish some sort of fund that will allow us to get what we need when we need it. Did I mention we haven’t gotten each other birthday, Christmas or Anniversary gifts but maybe once since we’ve been married? Yikes. Realize we are not perfect – This isn’t going to change overnight. It took us years to get where we are now and it’s going to take even more to get to where we want to be. And every now and then we’re going to spend too much on something we shouldn’t. But hopefully through this exercise we will be more conscious of our financial habits and make some healthy changes! Thanks everyone for reading this non-food/exercise related post! There will be more changes, this is just a start. Do you have any tips for financial health? I’d love to hear them! Friday, I gave another Amazing Grass product a shot. This time I tried the berry flavored grass powder. I tried both packets of chocolate and I have to say, for a chocolate smoothie person, I could not make myself like those at all, even one I made with a banana. So, would this one be any better? This one tasted loads better than the chocolate, but the smell, color and bitterness towards the end still left much to be desired. I could see myself using this powder in a smoothie where the taste and smell could be masked enough by the other elements, but I don’t know if it would help much with the gritty consistency. I’m off to do a Yoga Download before getting ready for church. Happy Sunday!